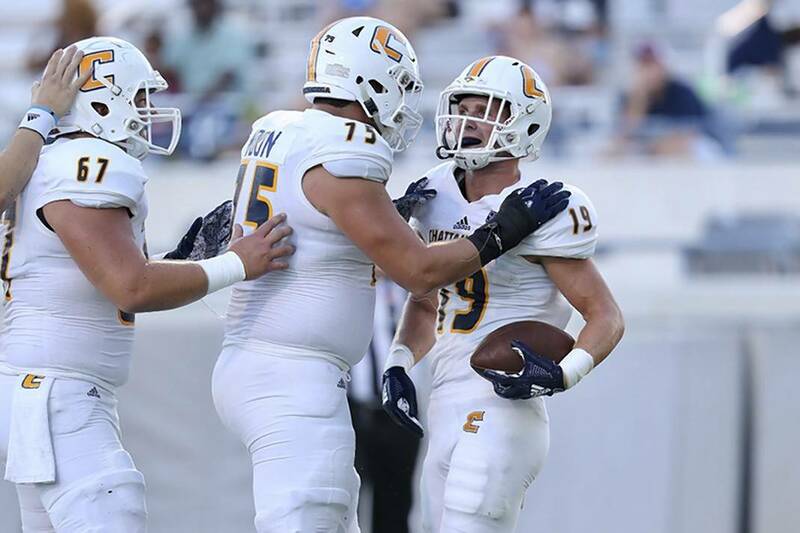 UTC wide receiver Bryce Nunnelly, right, celebrates with offensive linemen Harrison Moon, center, and Noah Ramsey after scoring a touchdown against The Citadel on Saturday in Charleston, S.C.
CHARLESTON, S.C. — Tom Arth recently said one of his biggest regrets from the University of Tennessee at Chattanooga's 2017 football season was not going for the win in overtime of a 24-21 loss at Wofford. Faced with a similar situation Saturday night, UTC's second-year head coach went for the win and cashed in. With the Mocs having just scored to cut The Citadel's lead to a point in overtime, Arth bypassed the PAT and went for a winning two-point conversion. Bryce Nunnelly took an end-around handoff and lofted a pass to a wide-open Jordan Giberti to give UTC a 29-28 victory in front of 8,076 at Johnson-Hagood Stadium. The Mocs (2-0, 1-0 Southern Conference) won in overtime for the first time since a 45-38 win against Georgia Southern on Sept. 22, 2007. The Citadel fell to 0-2 overall and in SoCon play. UTC junior running back Tyrell Price, who had 71 rushing yards, scored the touchdown that set up Nunnelly's pass to Giberti. It was Price's second touchdown of the game. Nunnelly said coaches had approached him Saturday morning and told him they were going to use him in that spot if needed. "I had the option to run it or throw it, depending on the defense," Nunnelly said. "As soon as I got the ball, it was open, and the safety and the outside linebacker started coming to me. I probably could have run it if I had to, but (Giberti) was so open, so I just threw the best I could to him and it worked." Added Giberti: "We've repped that play since the beginning of fall camp. Luckily it was drawed up perfect, they bit on the reverse and there you go, I was wide open." UTC quarterback Nick Tiano was 16-for-28 passing for 347 yards. Ten of those completions went to Nunnelly, who scored two touchdowns and had 268 receiving yards — the third-best total in SoCon history and the second-best performance in UTC history behind Joel Bradford's 274 yards against Furman in 2010. The UTC defense gave up 290 yards to the Bulldogs' triple-option attack but forced a pair of fumbles. The Mocs jumped out to a 14-0 lead behind their passing attack, which for the second consecutive week set up the run. Tiano lofted a perfect pass downfield on the team's second possession that Nunnelly settled under for a 76-yard score, and after Brandon Dowdell forced the Bulldogs to fumble in UTC territory, the Mocs responded with a six-play, 77-yard drive that ended in a bruising 16-yard scoring run by Price. The Bulldogs rallied in the second quarter, with Jordan Black capping a 12-play, 66-yard drive with a 3-yard run and completing a 25-yard pass on a wheel route to Grant Drakeford for a score after Tiano and Nunnelly had hooked up again, this time from 20 yards out. The home team started the second half with a 17-play, 78-yard drive that took 8:13 and ended in a 5-yard run by Black, but neither team scored again until overtime. Jacob Godek missed a 21-yard field-goal attempt, and UTC's Victor Ulmo missed two tries for three points, including a game-winning attempt on the last play of regulation. The Mocs played without receiver Bingo Morton, who was injured last week against Tennessee Tech. During the game they lost defensive linemen Telvin Jones and Devonnsha Maxwell, linebacker Tavon Lawson and long snapper Jared Nash. "I'm just so proud of our players," Arth said. "They really went through a lot of adversity. So many people stepped up, and we just kept fighting. That's as hard-fought of a game as I've been a part of, and to come out of that with a win on the road in an environment like this against a team like The Citadel, you've got to give all the credit to our players and their resiliency and toughness."